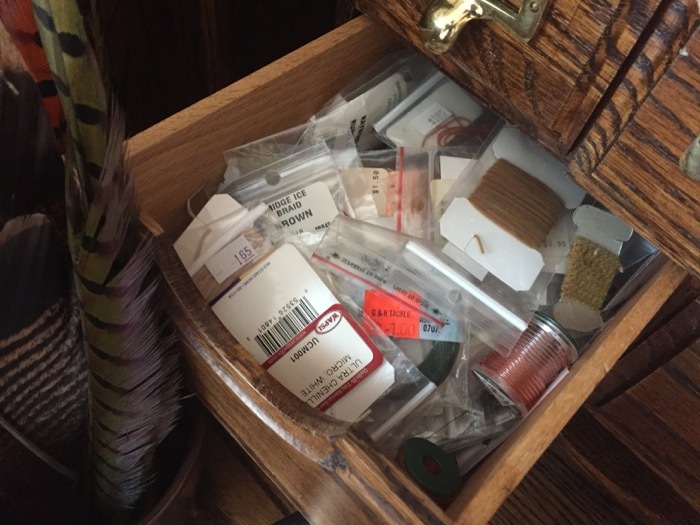 When I first started tying flies, I didn’t have a dedicated space to do it; let alone tools or materials. I literally took snelled hooks, smashed down the baitholder barbs on the shanks with needle-nose pliers, and secured them in the corner of my dad’s tool vise on his workbench in the basement. For materials, I basically used fur and feathers I cut off of old Mepps spinners and lashed them to the hook with my mother’s sewing thread (no bobbin). 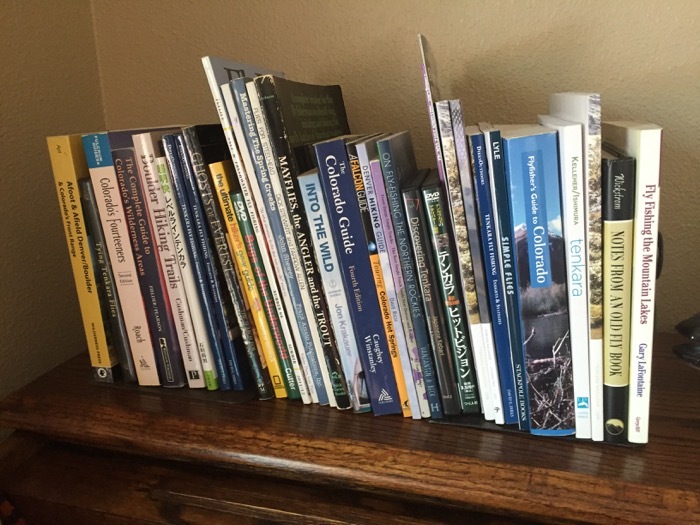 Eventually, when I was in high school, my parents gave me a space in the basement where I could set up a card table and plastic drawers where I could organize my materials. By then, I had a collection of “real” materials and fly tying tools and the space was right under a bright fluorescent light so the lighting was pretty good. It was a crude, but utilitarian and functional setup. 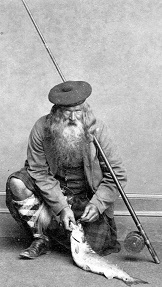 Every evening after school, I’d head straight for the basement and churn out flies as if I were a commercial tier. I thought my setup was great at the time–at least lightyears ahead of my father’s workbench and rusty tool vise. Until I started seeing pictures of other tiers using banker’s desks. You know, the rolltop ones with more drawers than a Michael Jackson jacket has zippers. 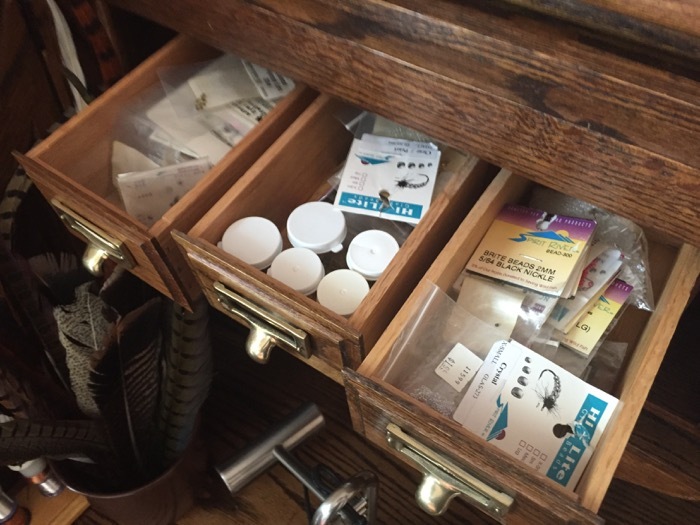 Not only did they just look classic and elegant, but they seemed to be the ultimate way to organize hooks, tools and materials–to have everything within reach. 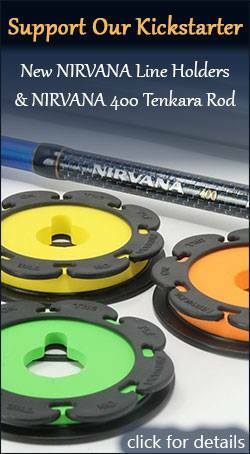 Everything about them fit the nostalgic fly fishing ethos. 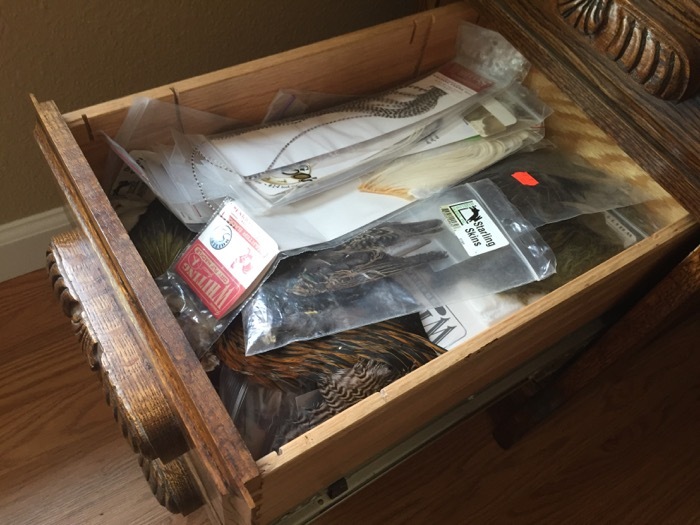 Not only that, but if I wanted to escape cleaning up a mess after a tying session, I could just roll the top down. Out of sight, out of mind. Of course, as a teenager with no money, it was out of reach. 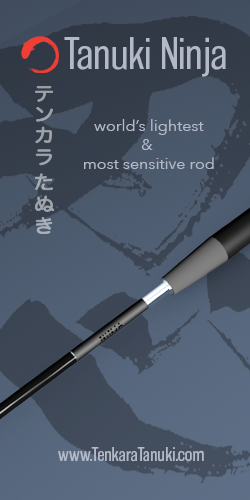 It seemed about as impossible as owning the $385 rods I lusted over in the Orvis catalog (yes, back then, $385 was actually high end). Then, in college, I really had no place to put a large desk. I barely had room to fit my clothes, books, and fishing gear in my dorm room. Mostly because my roommate’s laundry pile was slowly usurping the space. And again, no money. The dream slowly subsided and other things like family and work suppressed any fantasies about getting one of these desks. After all, I barely even had time to fish or tie, so it would have been a waste of money. Fast-forward to today and, well, I’ve got one! 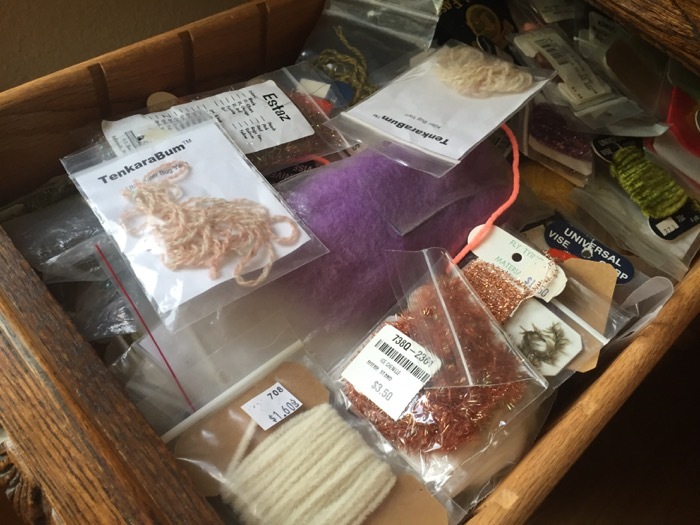 Some life changes have afforded me more time to tie and one day a few weeks ago, I told myself, “what the hell–just do it!” Almost instantly, I found one on Craigslist that was exactly what I was looking for and at a great price. I rented a truck and asked my friend Dennis Vander Houwen to help me move it. I was ecstatic and had the perfect corner in my new house in which to put it. 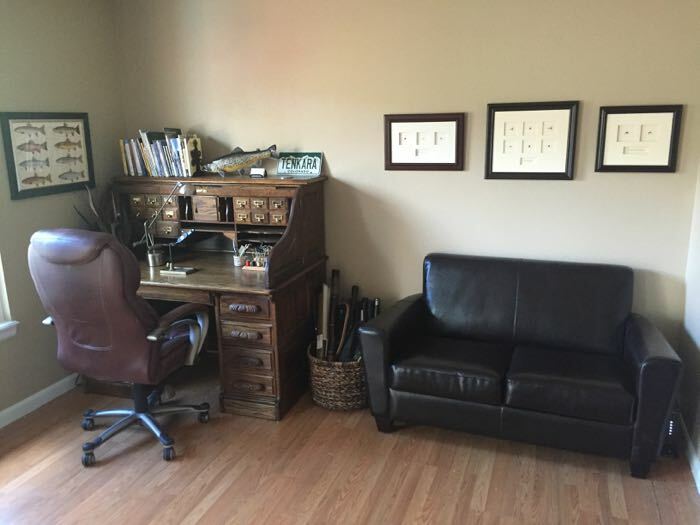 We got to the seller’s house–an older couple–and the desk was in absolute perfect condition. Not a scratch on it. Apparently, they just put it in the basement and never used it. I felt like it was a big score because I saw a lot of other ones on Craigslist for the same price that were pretty beat up. It was a dream come true that turned out to be even better than I ever imagined. There was only one problem. The desk was 500 lbs. There would be no way even the two of us could haul the unwieldy beast on to the truck. So, we had to take it apart. We took all the drawers out and separated the top from the sides. Even then, the pieces were cumbersome, but somehow, we managed to get it on the truck. Back at my place, it seemed as though the battle was nearly won. That is, until we discovered even the pieces wouldn’t fit through the sliding glass door. So Dennis took off the doors thinking that would give us a little more clearance. Nope. We had to take it apart even further. Finally, we managed to get everything through thanks to Dennis’ ingenuity and eventually got it all put together again. And it was glorious. A 25+ dream had finally been fulfilled. Here’s where it’s set up in the lower level of my tri-level house. 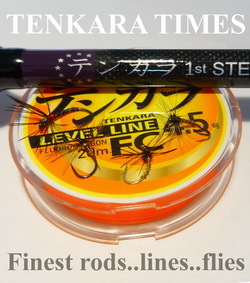 Nice, natural lighting, a comfy couch for browsing through fly pattern books, and surrounded by framed flies of Japanese tenkara legends. Not a bad place to hang out on a lazy weekend with a good latte or good friend. Over the next few months, I’ll be working on making it a more cozy micro “fishing lodge” to trade lies about the ones that got away. I initially adopted the mantra that “if it didn’t fit in the desk, I won’t keep it”. 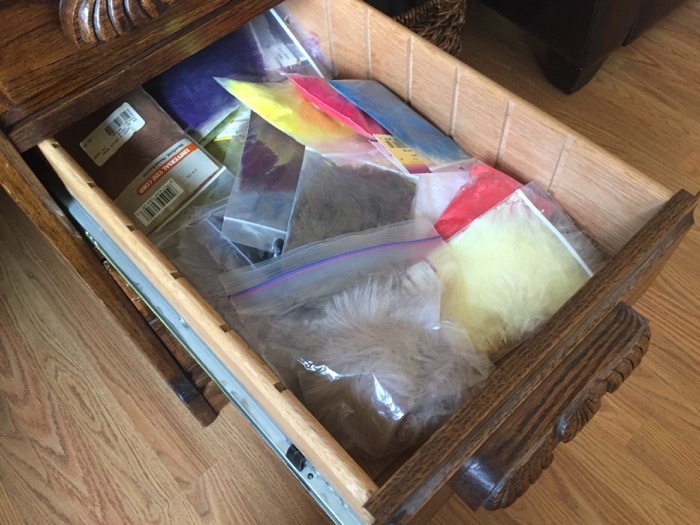 But then I realized I have two huge bins of synthetics and fur that wouldn’t really fit. I still tie saltwater flies, and those were too bulky to fit. So for the time being, they reside in “the annex” (i.e. my shed). 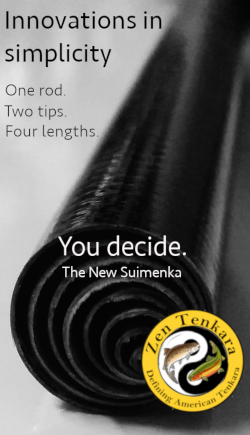 Some might think I have too many materials and that betrays the whole “simple” philosophy of tenkara, but you have to understand that I don’t only tie sakasa kebari. 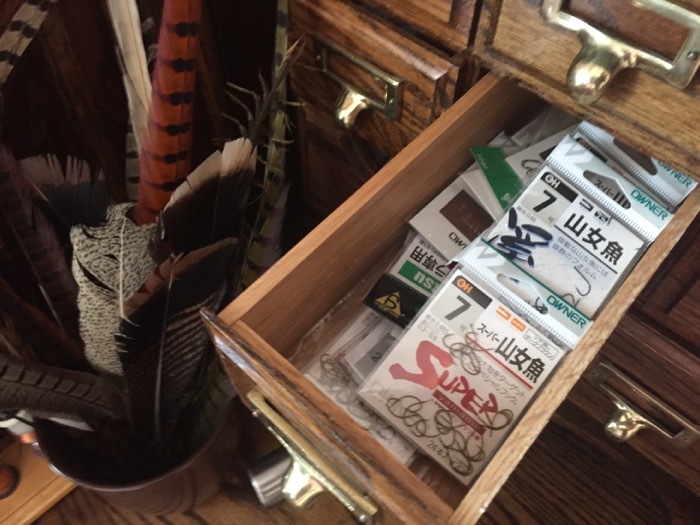 I tie bass flies, steelhead flies, saltwater flies, etc. It wasn’t gluttony that drove me to amass such a collection. 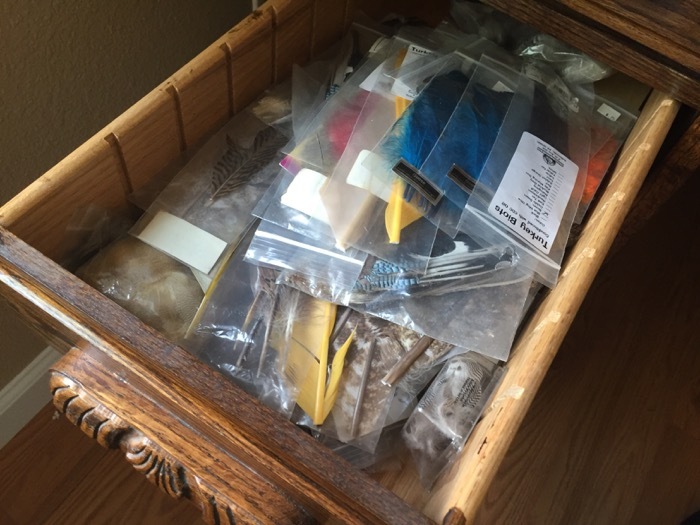 It was a combination of getting a deep discount from working in a fly shop and years of tying patterns for a wide variety of species. With the exception of consumables like thread and hooks, I’ll likely not have to buy materials for the rest of my life. 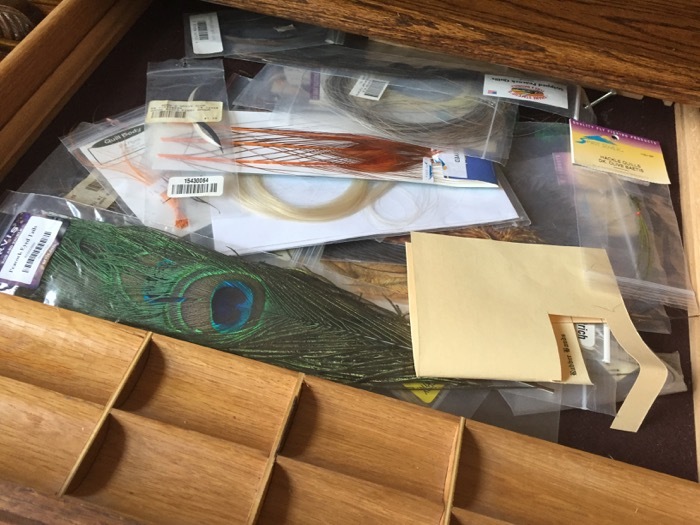 I can pretty much tie any pattern you can name right from the drawers of my new desk–from classic Atlantic salmon patterns to Rangely streamers, to panfish flies. And I like it that way. It makes me feel like a painter whose imagination is not limited to the paints in their palate. If you can name it, or I can dream it, I can probably tie it. 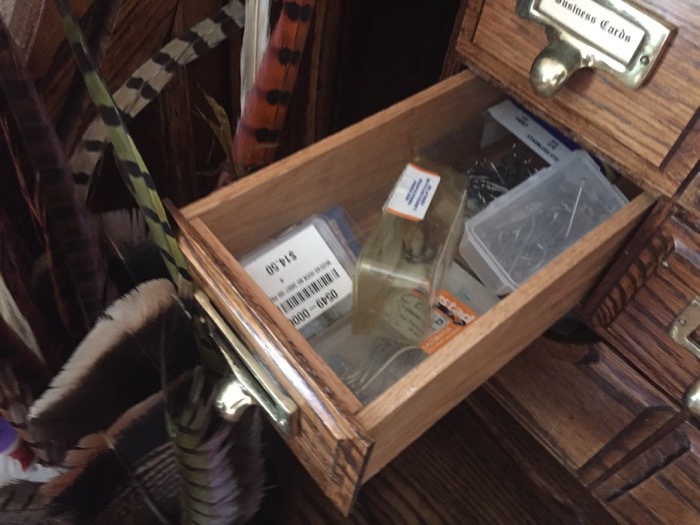 If I could travel back in time and show that determined, under equipped kid at the rusty tool vise with a clump of stained Mepps spinner hackle in his hands and deprived of any proper fly tying tools what he’ll eventually have, I’m sure he’d want to travel forward in time. 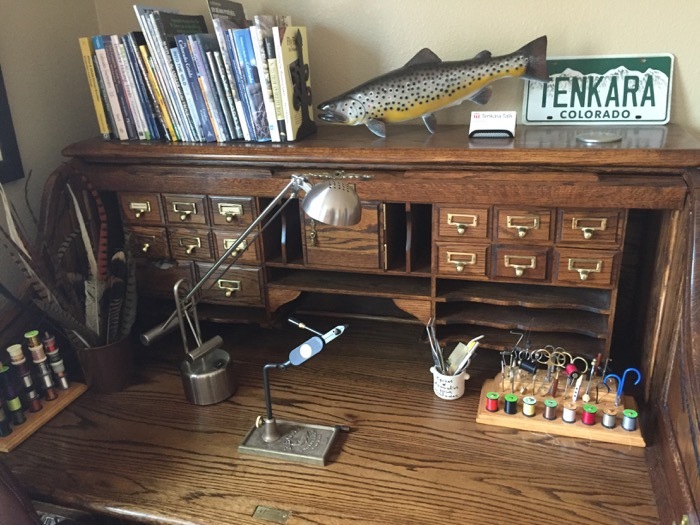 But while a good fly tying desk is gold, I might just see if he’d be willing to trade for his youth. That is a beautiful desk! With all you have been through lately you DESERVE it! Enjoy. I need to get on this myself soon too! 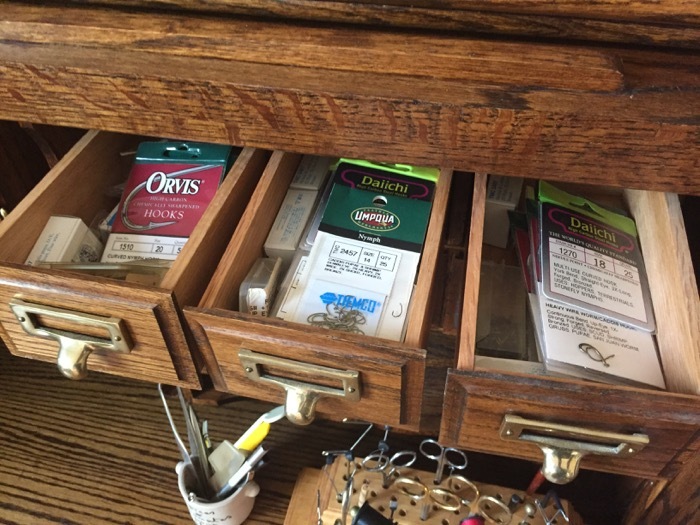 I’ve been tying out of boxes since my divorce and haven’t had the interest in organizing things better. “Love what you did to the place!” 🙂 I’ve gotten artwork from Anthony and a few others to frame up and hang as well. Glad you’re blogging again Jason! Thank you Jason for the post. Without talking/communicating with others who have a different perspective one always falls into a trap. Writers block sos to speak. 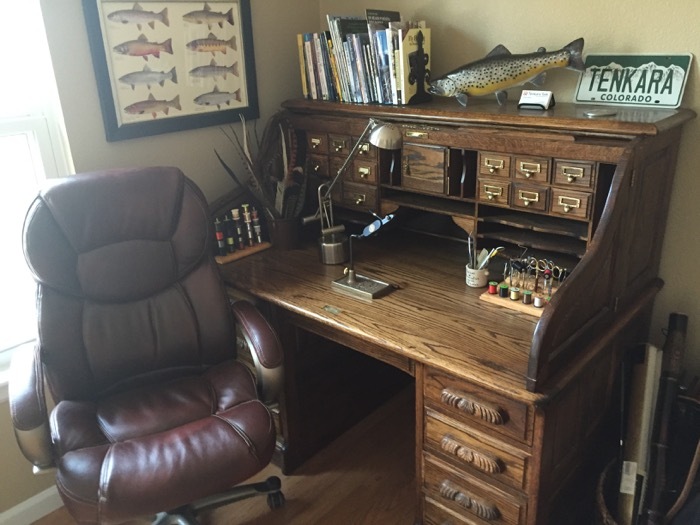 It’s a beautiful desk and perfect set up for tying…congrats to you. 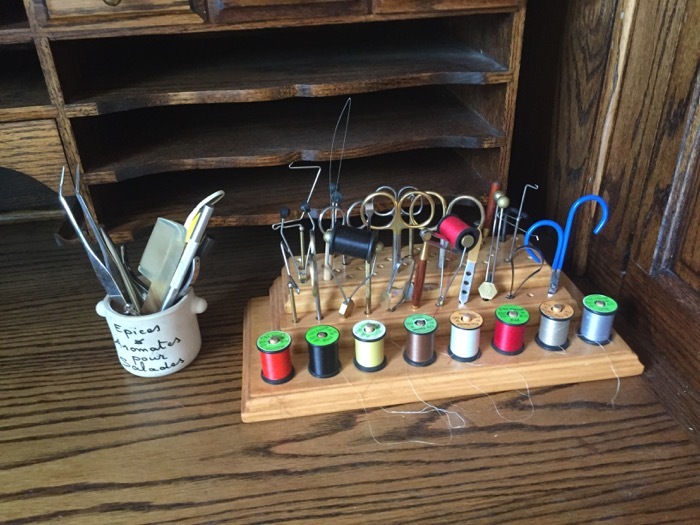 I have been tying at a snack tray table and fold out chair since I began tying and hope it will be less than 25 years before I attain a similar set up. I look forward to some posts to see what you have tied at the new desk. 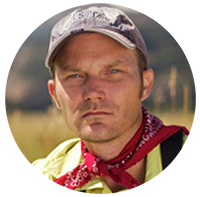 very nice – congrats Jason! That’s an awesome pro active way to align with your soul!!! 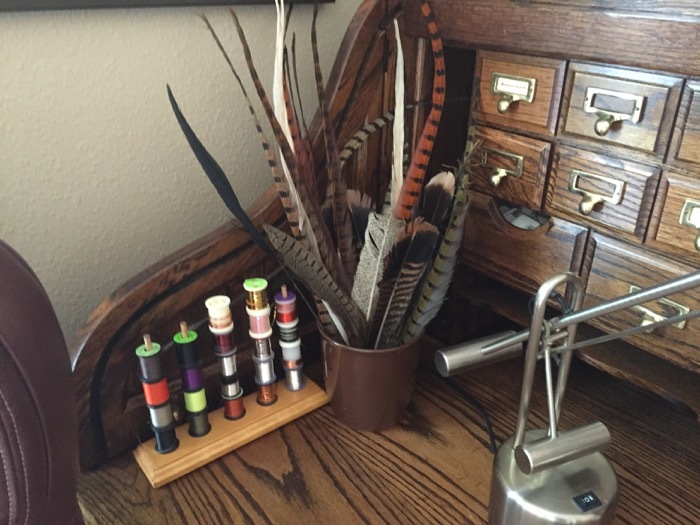 I am going to follow this idea and demonstration of yours and enhance my fly tying area too!!!! Great looking Oak desk; made well and very solid. Do put some kind of pad on top so it doesn’t end up looking like it has goose bumps from head cement. Glad to see you back writing so quickly, a thinking mind will keep a smile on your face. Stay “Forever Young” as your dreams come true. Walt, good idea about the pad. I’ll have to find something. Any suggestions? It is an awesome desk. It was a bear to get into the space. Happy to see it is now set up and that you are getting back on track again. Very nicely written post. That younger you is a lucky guy. If anyone else needs help moving a large desk like that into their home I am now charging an exorbitantly high price to do it. 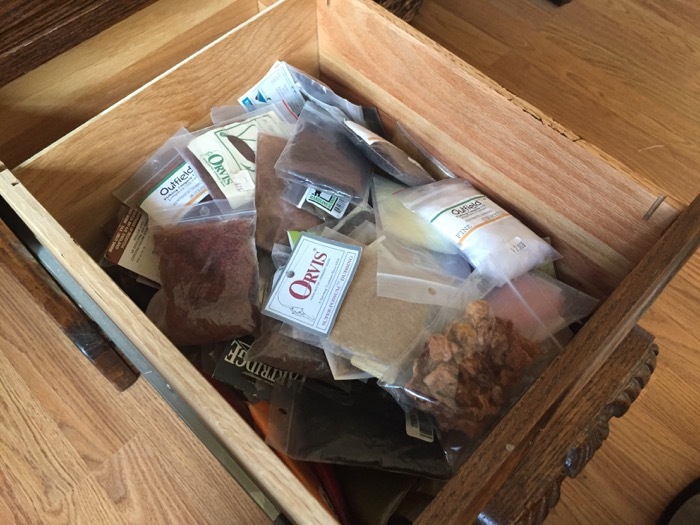 Wonderful story about the Desk Adventure and a neat “work” space. May the healing continue. Thanks for sharing. That is an awfully clean desk. Mine is hidden in a closet under the stairs with materials strewn all over. I’m afraid all my materials are thrown into plastic tubs under the desk. 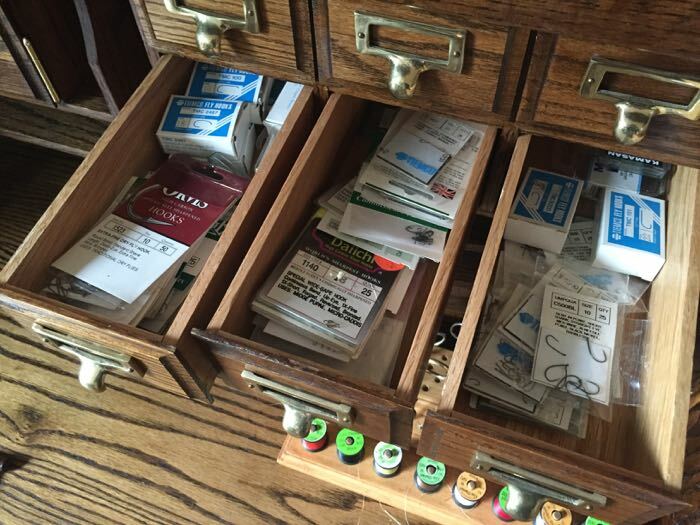 Some day I hope to be a little more organized. Welcome back. We have missed your posts. I have used both Plate Glass and Plexiglas as desk toppers. The Plate Glass is heavy, thick, and covers a small footprint (standard size from local glass shop). The Plexiglas is thinner, lighter, and can be cut to size much cheaper. It does scratch easier during cleaning but then again you can always cut another as needed. 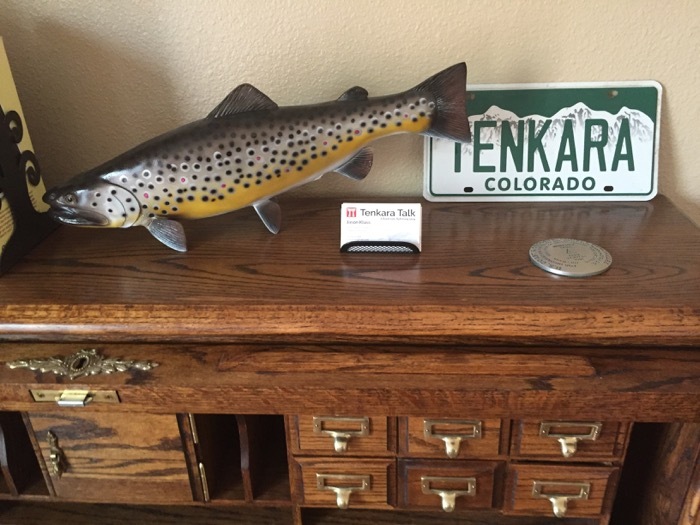 That is a nice Trout Carving….where did you find it? One word: Dustbuster. 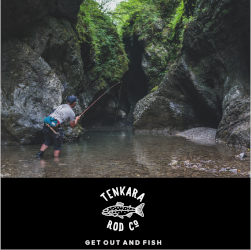 🙂 My desk is always pretty clean when I’m tying tenkara flies just because I use so few materials and it’s easy to clean up. But when I tie saltwater flies, it’s a disaster area with bucktail and maribou all over the place. The EPA Hazmat team won’t even clean it up. I got it on eBay years ago. Can’t remember the seller now but if you search eBay, you can find some pretty good deals on them.